Home / Antiques / Rutz Clovis point to sell for $400,000 at Morphy Auctions? Rutz Clovis point to sell for $400,000 at Morphy Auctions? The Rutz Clovis Point, a projectile head circa 10,000-9,000 BC, will lead Morphy Auctions' November 9 sale of prehistoric American artefacts in Denver with a $200,000-400,000 estimate. The Clovis people were early inhabitants of North America who first appear on the archaeological record 13,000 years ago. The distinctive bifacal stone spearheads, known as points, were used to hunt big game such as mammoth. The Rutz point, carved from green obsidian, was discovered in a wheat field in Douglas County, Washington in the 1950s and has remained in the same family ever since. At just over 9 inches, it is the largest ever found and is considered to be of great historical importance. 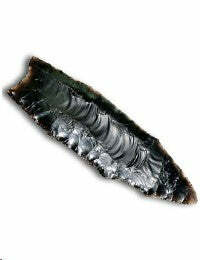 Other Palaeolithic items include a middle Tennessee Cumberland fluted point, estimated to bring $15,000-25,000, and a 10½ inch biface blade from Nebraska, made of Niobrara flint, valued at $10,000-15,000. A number of Archaic bannerstones will be offered at the sale, including a ferruginous quartz Tennessee-style bottle banner estimated at $15,000-25,000. Bannerstones are mysterious symmetrically carved stones featuring a central hole. There has been much discussion over the function that they played in prehistoric society, but are generally accepted to have been ceremonially important due to their prevalence at ancient burial sites. A hardstone raised groove axe, one of the finest ever found in Tennessee, is expected to make $7,000-10,000. Follow the link to sign up to our free weekly newsletter for more from the world of collectibles.